Your home's roof is its first line of defense against the elements. Maintaining it in a working order is one of the most important things you can do to protect your home from damaging water penetration. The typical asphalt shingle roof will last approximately 12 to 25 years depending on the quality of the shingle and the installation method. Re-roofing over your existing shingles with reduce your replacement costs but at the same time will shorten the life of your new roof. It is possible to re-roof over your exsisting shingles. Remove the layer of shingles that cover the cap or peak of the structure with the roofer's shovel. Apply the first row of shingles along the edge of the roof with the hammer and nails. Use four nails per shingle 3/4 inch above each cut-out. Do not nail on the edges of the shingles. 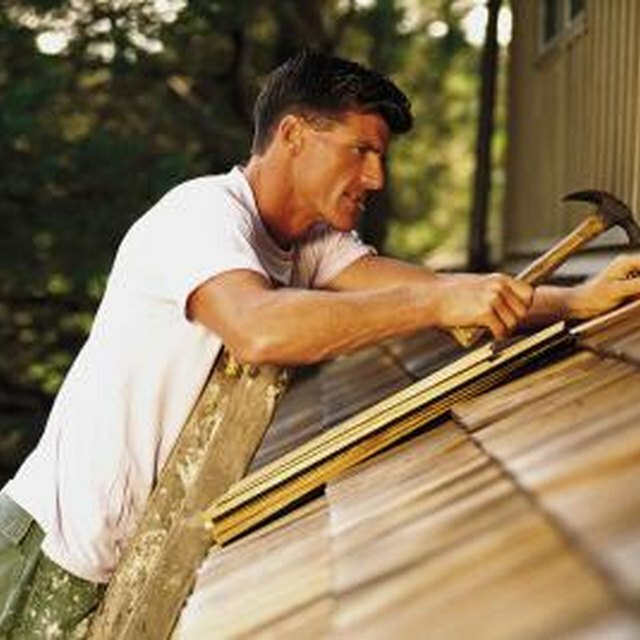 Apply the second row of shingles; stagger them exactly half of their width. Repeat this step for each row until you reach the ridge. Cut the excess shingles from edges and flashings with the hooked knife. Reapply the ridge cap once both sides of the roof have been completed. You can make the ridge cap shingles by cutting a number of shingles into thirds so that each section contains a tab. Begin on one side of the ridge and overlap the cap sections until you have reached the other. Apply roofing cement to any exposed fasteners on the roof surface. There should be a very limited number of these -- exposed fasteners are a weak spot for water penetration. Generally only asphalt shingle roofs can have multiple layers and you should never exceed three layers. Use slightly longer nails as you will need to penetrate the existing shingles and the roof sheathing. Multiple roof layers increase the dead load on the structure. In some cases this will cause roofing deflection.